Photographer Chris Carmichael shot over 1,200 photos in two minutes at 39,000 feet and managed to perfectly capture the total eclipse over Snake River, a major river of the greater Pacific Northwest region in the United States. The result was so beautiful that Inc. calls it “the most amazing image ever taken from a commercial airplane”. 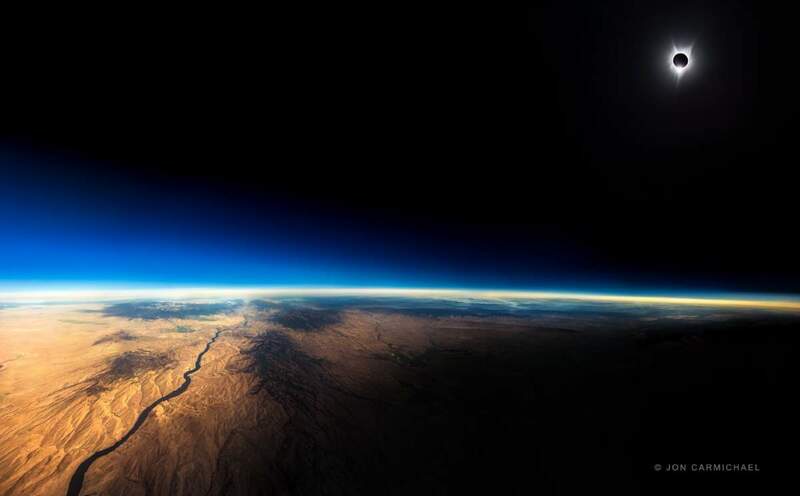 Carmichael shot over 1,200 photos in two minutes at 39,000 feet and managed to perfectly capture the total eclipse over Snake River, a major river of the greater Pacific Northwest region in the United States. He then spent almost a year to process the images into a giant photographic-mosaic titled 108. Limited edition prints of this wonderful image are now available for purchase via the photographer’s website. The photos are laser-printed on crystal archival substrate with microscopic crystals on the surface. According to Carmichael, this unique material gives prints exceptional vibrancy, saturation, and a 3D quality when lit. When Carmichael explained his mission to the flight crew, everybody teamed up to help him. Even the captain cleaned his window to ensure he’d have a crystal clear shot. Above and Beyond: Photographer Jon Carmichael captures The Great American Total Solar Eclipse 2017 onboard a Southwest Aircraft at 39,000 feet.